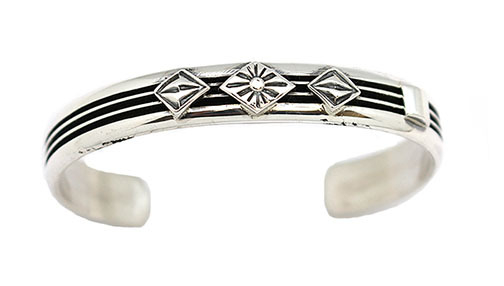 Sterling silver bracelet with 2 rail / 3 groove and 3 diamond and square designs soldered on top. It measures approximately 3/8" wide. It is Navajo hand made by Chester Charley. A few different designs soldered on top. Available with 3 diamonds 1 square, or 1 diamond, foot shape, square.